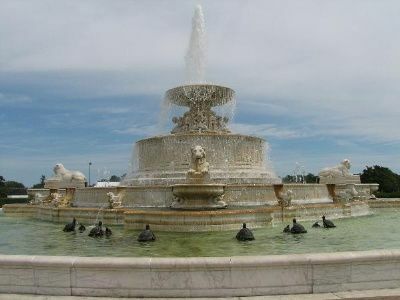 The James Scott Memorial Fountain is located at the west end of Belle Isle Park, which is situated in the narrows of the Detroit River, midway between the United States and Canada. The park itself was laid out by Frederick Law Olmsted between 1882 and 1884 and subsequently expanded and modified. 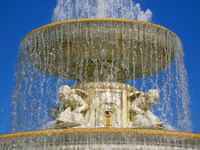 The fountain, executed of white marble, rises from a marble terrace in a series of basins. The basins are adorned with bas-relief panels. Sculpted lions, dolphins, and turtles, and the head of Neptune spout water. A life-sized bronze statue of Scott, set on a granite plinth, faces the fountain. The sculpture was executed by Herbert Adams. Marble steps leading from the fountain terrace to the river evoke the design of Bethesda Terrace in New York's Central Park.